Like Rugby with Radishes. 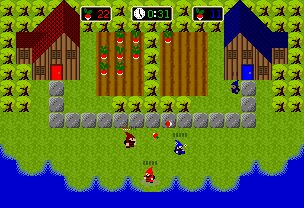 Tackle an opponent, grab their radishes, run them home, and defend your goal against anyone who'd plunder from it. 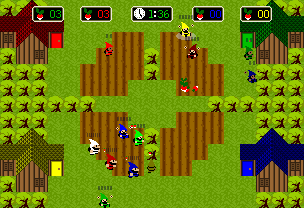 Up to 12 people can play at once, and AI is included for single player mode. Highly addictive. 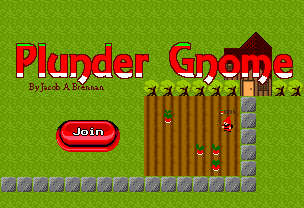 The original Plunder Gnome was made in 2006, and this is a rewrite of that game with new graphics, smoother controls, and better gameplay. If you enjoy Plunder Gnome, consider buying a subscription. Instead of in-game perks, I'll program and release updates once we reach certain funding goals, like a crowd funding campaign. One of the best original BYOND Games. Subscriptions go toward development stretch goals: once funding goals are met, new content is added to the game. There are currently no in-game perks to being a subscriber.